PERFECT DEAL FOR THOSE GUESTS THAT WILL BE OUT EXPLORING THE ISLAND AND BEACHES DURING THE DAY! Kahana Reef is scheduling repair work to the seawall during daytime hours. Construction hours will be Monday through Friday 8am - 5pm, with heavy construction starting after 9am. The work will require heavy machinery which may be loud and disruptive during your stay. Makai lawn areas will be off limits in and around the construction area, beginning at the south end. The pool may or may not be closed at some point. That will be determined as work moves closer to the pool area. Our “Maui Getaway” is located in a very peaceful setting on the top floor of an oceanfront condominium complex. Relaxing on our private lanai enjoying some Kona coffee is the perfect way to start your day. You never know what you will see while watching the ocean reef from here: humpback whales during the winter season, dolphins, turtles, eagle rays, and possibly a Hawaiian monk seal, which is a very rare site. This is also an ideal spot to enjoy the sunset over the island of Lanai or simply sit back and watch the kayakers, snorkelers, swimmers, and sometimes even surfers. Kahana Reef has an oceanfront pool just down the sidewalk and 2 Jenn-Air gas grills by the lawn. There are elevators either direction from our unit for easy access to the top (4th) floor. There is a laundry room onsite with 6 washers & dryers. If you are looking for a quiet haven or a romantic escape this is it! The sound of the waves and the gentle breeze of the trade winds are sure to lull you asleep at night. The majestic island of Molokai is even visible from the kitchen, which is complete with pots, pans, dishes, glasses, grilling utensils, coffee maker, etc. There is a flat screen TV, coolers, games, and books for your enjoyment. In addition, there is a secure WIFI Internet in the condominium. Kahana is the perfect location with championship golf courses and some of “Americas Best Beaches” within a 10 – 15 minute drive either direction from the complex. So what are you waiting for? Escape to our “Maui Getaway” and you are sure to return, as do many of our guests. Click on the map below to see some of the restaurants within walking distance from the condo. In this photo, I am enjoying an evening at the Old Lahaina Luau in Lahaina, one of my favorite experiences on the island. While living on Maui I fell in love with this part of the island for it's cooler evenings and more relaxed atmosphere away from the hustle of the busy beaches. Convenient location: some of my favorite restaurants and the local farmers market are only a 10 minute drive away. If I run out of coffee, etc., there is a Whaler's General Store within a 10 minute walk. This location cannot be beat !! Truly oceanfront - listen to the waves - watch the sunset !! There is a telephone in the condo for emergencies and all local calls. 6 coin-operated washing machines in laundry room on ground floor. Limited hours of operation. 6 coin-operated dryers in laundry room on ground floor. Limited hours of operation. Enjoy the view of the ocean and the island of Molokai while cooking on the stove! Oceanfront lawn with lawn chairs provided. There is a book exchange of sorts by the laundry room. 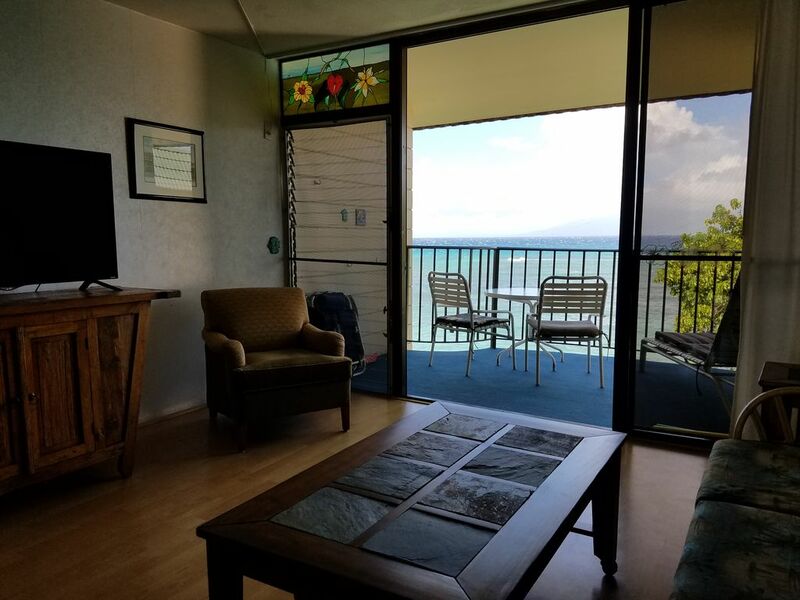 Inside the condominium you will find coolers for the beach ... a thermos for coffee to watch the sunrise at Haleakala ... binoculars for whale watching off the lanai ... laundry basket, iron, and ironing board ... board games and movies.